The puppy/dog motif is a great choice for any girls' bedroom. Your dog lover will be very happy with any of these bedding choices that feature cute puppies and dogs in a variety of designs and colors. 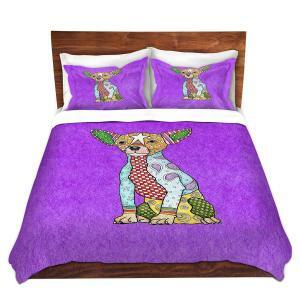 2Decorate sells an adorable reversible Chihuahua dog duvet cover set by Dolce Mela. The reverse side of the duvet is an attractive beige, white, and purple stripe. The reversible aspect of the duvet gives it a two for the price of one value. The set comes packaged in an elegant gift box and Dolce Mela gift bag. "Very high quality material and very cute!" "My daughter absolutely loved this." "Looks adorable on her bed!!!" Price: 2decorate's twin XL (dorm size) is about $149 + free shipping; Wayfair's twin is around $122 and the queen is $150, with free shipping for both sizes. Walmart gives a great combo of teal, pink, purple, and yellow accents with its Mainstays Kids Puppy Love Bed in a Bag Bedding Set. This is an ideal choice for any girl who loves blue as well as dogs. Other colors in this set allow for several secondary and accent color choices when decorating a girl's bedroom. "It's not a scratchy fabric for the comforter and the sheets are silky. Very nice set!" "This bed set was just the right balance of cute but not too girly." "Even cuter in person and the quality is very good." "The sheet fits perfectly to the bed and it's not loose on the corners." 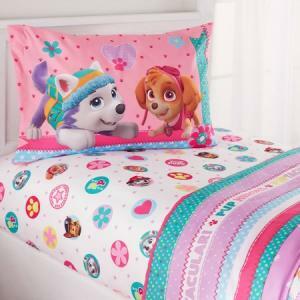 Walmart also offers the ever popular PAW Patrol Girl 'Best Pup' Twin Bedding Sheet Set by Nickelodeon, featuring "Best Pup pals Chase, Skye, Marshall and Everest." Pinks and teals are the main colors for this cute bedding. Colorful medallions feature paw prints, heart and flower shapes as well the Pet Pals. The three-piece twin bedding set includes a fitted sheet, a flat sheet, and a pillowcase. You can also add a reversible Twin/Full Comforter to complete the look. "My daughter loves the colors, the characters and the feel of these sheets." "Seem to hold up well in the wash."
Price: About $20 with free shipping on $50+ orders or free store pickup. Sometimes, all you need to change the look of a bedroom is a nice duvet cover and matching pillow shams. Amazon has the perfect set for dog lovers who are also purple lovers. This unique DiaNoche Designs By Marley Ungaro duvet set features a patchwork chihuahua that captures the heart and answers the desire for a dog motif bedding. Available in twin, queen and king sizes. Cotton-poly blend with "super soft" brushed twill finish. Corner ties and zipper closure secure your choice of insert. Purchase options include the duvet only or a duvet set. The set comes in a two-piece twin set that includes a duvet and sham. The three-piece queen and king sets include the duvet and two shams. Pros: The duvet has corner ties as well as a zipper closure for placing your choice of insert. However, you can pick up the duvet in the set or separately. Cons: Cost is on the high side and might be more than most people wish to spend for a girl's bedding set. 2decorate offers an adorable reversible duvet set. The snuggable Carlino Pug and sprig of pink blossoms design is set against a crisp white background for a unique and fun look any girl will love. As with any bedding set, this one comes with pros and cons. Pros: Twin size fits regular twin and dorm size twin XL mattresses and the duvet cover is reversible. Plastic snaps are hidden at the foot of the duvet cover for easy access to insert your own quilt or blanket. Cons: Cost may be more than some people want to spend for a girl's duvet set. AliExpress features this cute cartoon-like sophisticated spin for a girl's bedding choice. The set is available in full, queen and king sizes. 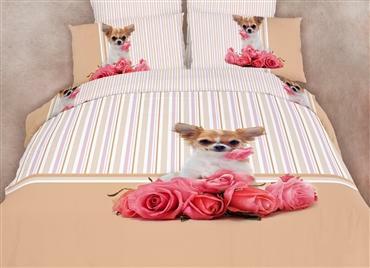 The "Beauty Girl & Her Dog" duvet cover set displays the adorable iconic Parisan style "Beauty Girl". The cute Beauty Girl is drawn with dark hair styled in bangs and red-ribbon tied pigtails. She wears a large red beret and a horizontal red and black striped top complementing her long black leggings and red shoes. She holds a leash to her dog that is sitting at her feet with a "My Dog" ribbon hanging from its collar. A few pros and cons are found with this set from AliExpress. Pros: Unique fun stylized design will delight girls seeking a more sophisticated design at a moderate price. Those wishing to use a flat sheet with their duvet will be thrilled since this set includes a flat sheet instead of a fitted one. Cons: The European-style sheet (flat) may not appeal to those accustomed to snug fitted bottom sheets. Delivery time may be a little longer than what some customers expect; it's estimated at 12 to 21 days. 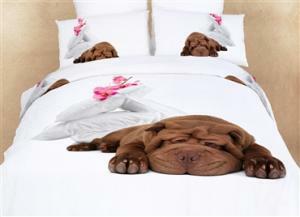 There are many choices for girls wanting to express their love of dogs when it comes to decorative bedding. Select the ideal one and design a great bedroom around it.